For August, the average contiguous U.S. temperature was 73.6°F, 1.5°F above the 20th century average and the 17th warmest on record. Above-average temperatures were observed in the Southwest and Northeast with near and below-average temperatures in the Plains and Southeast. During meteorological summer (June-August), the average temperature for the Lower 48 was 73.5°F, 2.1°F above average, tying with 1934 as the fourth warmest summer on record. 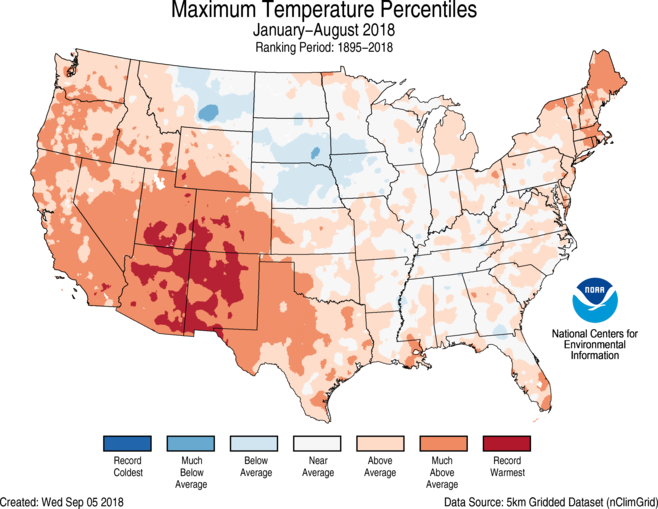 For the year to date, the contiguous U.S. temperature was 55.7°F, 1.8°F above the 20th century average and was the 10th warmest January-August on record. The August precipitation total for the contiguous U.S. was 2.99 inches, 0.37 inch above average, and tied as the 20th wettest August in the 124-year period of record. Hurricane Lane grazed the Hawaiian Islands, bringing torrential rainfall to portions of the state. Both the summer and year-to-date precipitation totals for the contiguous U.S. were slightly above average but masked regional extremes. See all August U.S. temperature and precipitation maps. Above-average August temperatures were observed along both coasts. Five states in the Northeast – Connecticut, Delaware, Massachusetts, New Hampshire and Rhode Island – each had a record warm August with six additional states in the region having a top 10 warm August. The record and near-record warmth across the Northeast was driven largely by record warm overnight low temperatures. Four states in the Southwest also had a top 10 warm month. Near- to below-average conditions were present in the Plains and parts of the Southeast. Kansas and Nebraska were both cooler than average. 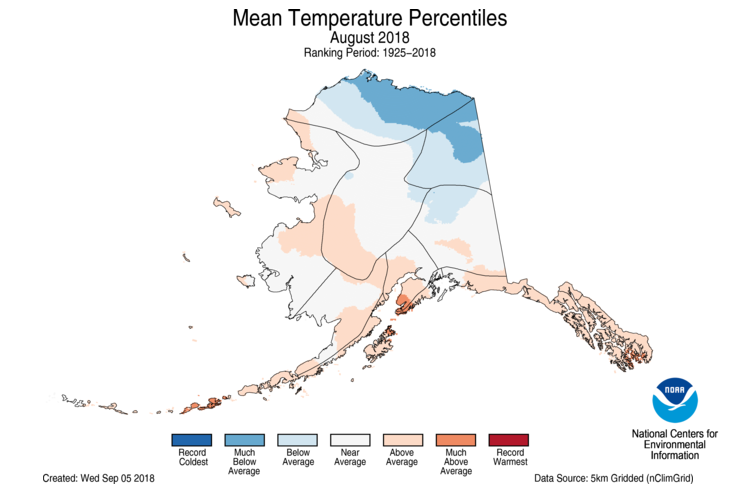 To the north, parts of Alaska were much cooler than average in August. Barrow (Utqiaġvik) had its coldest August since 2006. Above-average precipitation was observed for many locations from the Great Plains to the East Coast where slow-moving weather systems dropped heavy rainfall. Eight states from the Lower Mississippi Valley to New England had much wetter than average conditions with record precipitation in parts of the Midwest and Mid-Atlantic. Alaska had its fourth wettest August on record. No state was record wet. Below-average precipitation stretched from the West Coast to Rockies with California tying its 10th driest August on record. Across the West, several large and destructive wildfires, including many that began earlier in the summer, burned in August. Monsoonal moisture helped to boost precipitation totals for localized areas in the Southwest. In late August, Hurricane Lane skirted to the southwest of the Hawaiian Islands. The storm brought heavy rainfall and strong winds across the state. Significant flooding was observed on the east side of the Big Island, with preliminary reports of more than 50 inches of precipitation. Ongoing drought in the state combined with strong winds from Lane fanned a wildfire that destroyed more than 20 homes on Maui. According to the August 28 U.S. Drought Monitor report, 34.4 percent of the contiguous U.S. was in drought, up slightly from 34.1 percent at the end of July. Drought conditions improved in parts of the Southwest, Central to Southern Plains, Deep South and Northeast. Drought conditions worsened in parts of the Northwest, Northern Plains, mid-Mississippi Valley, central Great Lakes and southern Texas. Drought only improved slightly in Hawaii with many of the drought-stricken parts of the state missing out on the heavy rains from Lane. Above-average summer temperatures spanned most of the nation, with only one state having near-average June-August temperatures. Twenty-three states across the West, South and Northeast had much-above-average summer temperatures. This included Rhode Island and Utah, which were record warm. The nationally averaged minimum temperature (overnight lows) was exceptionally warm during summer at 60.9°F, 2.5°F above average and 0.1°F warmer than the previous record set in 2016. Every state had an above-average summer minimum temperature with five states record warm. In general, since records began in 1895, summer overnight low temperatures are warming at a rate nearly twice as fast as afternoon high temperatures for the U.S. and the 10 warmest summer minimum temperatures have all occurred since 2002. Above-average precipitation was observed for many locations from the Great Plains to the East Coast, with much-above-average precipitation in parts of the Midwest and Mid-Atlantic. Pennsylvania had its wettest summer on record with 18.78 inches of precipitation, 6.56 inches above average. This surpassed the previous record of 17.78 inches in 1928. Below-average precipitation was observed for much of the West and parts of the South. Washington State had its 11th driest summer on record receiving about half the seasonal average. Monsoonal moisture helped to boost local precipitation in parts of the Southwest, but the region overall was drier than average. Above-average year-to-date temperatures were observed for much of the nation with record warmth in the Southwest. Arizona and New Mexico each had their warmest January-August on record. Near- to below-average temperatures were observed in the Northern Plains and Upper Midwest. Afternoon high temperatures were particularly cooler than average for the Northern Plains. Above-average January-August precipitation stretched across the Northern Plains, Upper Midwest and from the Southeast to Mid-Atlantic. Maryland and Pennsylvania each had their wettest year-to-date on record. Below-average precipitation fell across parts of the West and Southern Plains. Colorado and New Mexico were both much drier than average. According to the August 22 U.S. Drought Monitor, moderate to extreme drought covers 12.1% of the contiguous U.S. According to the May 9 U.S. Drought Monitor, moderate to extreme drought covers 5.2% of the contiguous U.S.